Have you ever noticed that there is a large stone on Redland Green near the Hartington Park and Woodstock Road junction? Generations of children have used is as a base, a castle or place of refuge in games. (Incidentally my children, now teenagers, do not seem to have had words of truce for use in games, perhaps due to the influence of television. When I was at St John’s School in the 1950’s, the formula was to stand with fingers crossed and say ‘Krees’ which I presumably learnt at school rather than at home. Apparently such truce words have been mapped across England and Wales and show interesting ‘tribal’ distributions. You might like to remember whether PE shoes were known as daps, plimsolls or gym shoes before they all became trainers). The stone has certainly been there for more than 100 years. It appears to be made of a stone unlike that found in the immediate area (i.e. it is not the white limestone or the red sandstone) and has a number of interesting hollows on its top surface. Some have seen an explanation in its proximity to the presumed line of the Roman Road from Sea Mills to Bath as a boundary marking stone or a road-side shrine where votive offerings for safe travel could be made. Nobody knows the exact line of the Roman Road from the visible remains on the Downs although its name ‘Via Julia’ appears in the tiles above Daly’s Village Market at the end of Lower Redland Road. To others it is just a piece of stone too large to be removed easily. It does seem to be suffering more damage from vandalism recently and it would be a pity to lose a possible link with ancient history. Have you ever noticed that there is a narrow footpath from the pedestrian crossing on Redland Road near the bus stop to Hazel Avenue off Chapel Green Lane and the Elm Lane and Lower Redland Road junction? Why should there be such a footpath with Chapel Green Lane so near? If you look at the houses in the block from Redland Hill below Redland Hill House to the top of Chapel Green Lane and Lower Redland Road, you will see that they are all built in the style popular between the First and Second World Wars. Properties to the west are early- to mid-Victorian grandeur (The Shrubberies and Elgin Park) and to the east are late-Victorian affluent. The 1925-1930 infill development used land retained for agricultural use which included a herd of Jersey cows from which the milk was sold in a dairy on Lower Redland Road. The footpath follows the line of a path across the fields which the developers had to maintain as a public right of way. So next time you use the lane, stop and close your eyes and imagine a 90 year time warp to bucolic Redland! 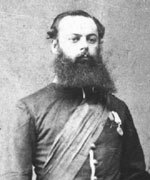 Colonel John Charles Campbell Daunt was buried with full military honours on 21 April 1886. The deceased Colonel who since his return from India on sick leave, had resided at Overy House, Tyndalls Park since 1 July 1885 whence his arrival from Tunbridge Wells was noted in the Clifton Chronicle of 8 July 1885. He obtained his Victoria Cross for acts of heroism during the Indian Mutiny. He entered the Indian Army in 1852 and took part in the action with the mutineers of the Ramghur Battalion at Chota Nagpore on 2 October 1857. The mutineers were, after a hard struggle, defeated but not until they had killed or disabled one-third of our weak force, whom they mowed down with grape. Two of the enemy’s guns caused great havoc in this way and affairs looked critical when with Sergeant Denis Dynon of the 53rd Regiment, Colonel (then Lieutenant) Daunt rushed forward and pistoling the artillerymen, silenced the guns. Again on the 2 November at Nowadah, Behar, Daunt with a few of rattray’s Sikhs, pursued a large body of mutineers of the 32nd Bengal Native Infantry into an enclosure in driving them from which he was severely wounded and the preservation of his party was mainly due to his gallantry. He was awarded the Victoria Cross and subsequently served in the China Campaign of 1858 being present at the affair with the braves of the White Cloud Mountains, at the repulse of the Chinese at the landing pier and at the Magazine Hill receiving a medal for his services. Many will know the building on the far side of the Green between the Children’s Playground and the allotment entrance called Redland Green Farm. The photograph, which is about 100 years old, shows how little the building has changed, although all else around is different. The earliest local plans from 1811 show a building in this location. From about 1840 we have more information from the Tithes Commission records: the farm comprised about 28 acres which is more or less the area bounded by the stream in the middle of the allotments, Cranbrook Road, Kersteman Road and Redland Court Road. It was primarily a dairy farm as there were two cowsheds: one behind Dugar Walk and the other in the kink in the north-east edge of the Sports Field. Just in case you think that the farmer was keeping away from smelly animals, there were five pig-styes behind the farmhouse. At the time of the photograph, the farmer was William Biggs and the original is clear enough to read the writing on the shed advertising the Dairy and Cream Teas. It is believed that the Biggs family left the farm about 1910 following an outbreak of foot and mouth disease. They were then connected with the Biggs Dairy at Henbury. It could be that there was also a connection with the Mrs Biggs who ran a dairy on Lower Redland Road opposite the Shakespeare in 1919. However by then the farmer was William Silas Ball. His daughter was at school with Joan Wakefield who is still a member of the congregation. It is not clear when the farm ceased agriculturally. By the early 1920’s the fields were being used for sports purposes and by 1930 most of the present building had been completed with St Oswalds Road and the area by Chapel Green Lane. One problem in trying to trace occupancy of the farm is that those compiling Kelly’s Directory did not recognise that it existed! Peter Davey of Downs Park East who many will know through his books on Bristol Trams has kindly made available this photograph taken by his father S Miles Davey. The exact date is unknown but it was probably in late 1938 or early 1939 as the trams ceased on the Zetland Road to the Downs route in July 1939. I am sure there are some of the older members of the parish who remember Bristol trams. On the tram standard on the right hand side can be seen a tram stop board. One of the features of trams was that the distance between stops was half that of the replacement buses. The Company intended to save money by reducing fuel consumption of starting and stopping the buses! The roundabout did not appear until the 1960’s and the tram tracks swung across Redland Road to make the curve into Redland Hill as easy as possible. A plaque outside Bristol Temple Meads Station (illustrated) commemorates a “Miss Emma Saunders, the railwaymen’s friend”. 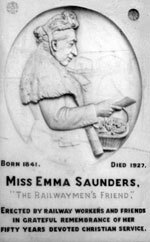 EMMA SAUNDERS, a pioneer member of the Railway Mission, founded in 1881, was born in 1841 and died in 1927. After early experience working with girls in a Bristol industrial home, and with children in a “Ragged School”, she took over visiting rail staff and their families in the Bristol area in 1881 from Miss Louisa Stevenson, who had had to give up because of ill-health. Miss Saunders’ original “patch” covered the Clifton Extension Railway, the Severn Tunnel and the loop line at Pyle Hill, but developed over the years to include every line out of Bristol, including the sail and tarpaulin sheds, wagon sheds, carting depots, waterside cranes, coaling and repair sheds, the old and new locomotive sheds and the Harbour Railway. She was assisted by a team of women who parcelled up the religious literature and little gifts she distributed and some of these, including a Miss Hickman, assisted her with the visiting. In an effort to prevent young railway staff who came to Bristol as strangers succumbing to the “temptations associated with licensed premises”, she set up the Bristol & West of England Railwaymen’s Institute, the forerunner of today’s British Rail Staff Association at Bristol, which provided a canteen, bagatelle, billiard rooms, skittle alley and a room for engineering classes and religious meetings. On her visits to railwaymen she always carried a small basket containing posies of flowers which she would give to the men to whom she spoke. She, and her companions on visits, held “tin passes”, authorising them to travel on all locomotives, and in goods brake vans. On March 2, 1921, her 80th birthday, she was presented by H. R. Griffiths, the Great Western Divisional Superintendent, with an illuminated address, a settee and an armchair, to which more than 5,000 GWR and Midland railwaymen in the Bristol area had subscribed. She died on February 27, 1927, and her temperance movement was taken over by the Social & Educational Association, later absorbed into the BRSA. The memorial tablet to her at Temple Meads Station was erected, as it records, by railway workers and their friends. Alexander Fletcher Jones was the fourth son of William Jones of Lochmaben, Dumfriesshire. His early education is not recorded but he was admitted as a Scholar of Brasenose College, Oxford in the autumn of 1872 at the age of 18. He obtained first class honours in Mathematics in 1875 and Natural Sciences in 1876 remaining at college until 1877. He then took up a teaching appointment at Clifton College, Bristol. On the tragic day of 16th February 1878, two parties of the Clifton College Cadet Corps went to the firing range at Avonmouth. The range was situated to the north of the Avonmouth Hotel at the terminus of the Port and Pier Railway more or less on the site of Holesmouth Junction at the north end of St Andrew’s Road. The Cadet Corps was attached to the Administrative Battalion of the Gloucestershire Engineer Volunteers – the first party was in charge of Sergeant William Elton and Alexander Jones, who was a Lieutenant in the Corps was in charge of the second. Firing took place on the 200 and 300 yard ranges and both parties returned by the 5.35 pm train from Avonmouth to Hotwells. As the train stopped at Sea Mills, conversation between Sergeant Elton and one of the cadets, Edward George Hemming, turned to some previous shooting where Elton was not present. Hemming put his Sneider Enfield rifle on his knees and demonstrated how timid a boy was in shooting, waving his gun about. Unfortunately in the rush to catch the train, Hemming had not unloaded the rifle which went off. The bullet went through the compartment wall passing between Lt Colonel Edward Plant and Mr John Grenfell. It hit Alexander Jones, killing him instantly, and lodged in the compartment wall (whence it was cut out by Mr Pritchard, surgeon, of Chesterfield Place). As Jones was obviously dead, the train proceeded to Hotwells where Mr Pritchard attended confirming the death. The inquest took place at the Clifton College sanatorium on the 18th February. Mr H S Wasborough was the Coroner, also present were Dr Percival, Headmaster of Clifton College, Mr G W Hemming QC (father) and Mr Appleton, solicitor of Oswestry who watched proceedings on behalf of the friends of the deceased. The Coroner made it abundantly clear to the jury at the outset that he expected them to return a verdict of accidental death. In his summing up he said, “In a case like this one could not help feeling deep sympathy with the family of the deceased but he could not help thinking that they should extend their sympathy to the young man who had been the innocent cause of the death of this young officer”. The jury did as bidden. It may well be that Alexander Jones was responsible for his own fate. He was in charge of the range where Hemming was shooting and therefore he had to check that all rifles were unloaded and cartridges returned as cease-fire. 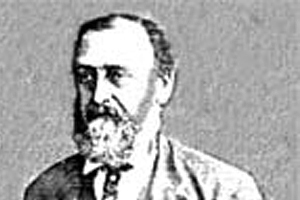 One does wonder whether the inquest would have been as sympathetic if the father had not been such an eminent lawyer or if the deceased had been a more eminent or longer serving member of staff.Mr G W Hemming (1821-1905) was appointed the Official Referee in 1877 and edited the Equity Law Reports from 1865 to 1894. Edward Hughes Hemming was the oldest surviving son and was born in 1860. From Clifton, he entered the Royal Military Academy, Woolwich, joining the Royal Engineers in 1880. He was mentioned in despatches during the 1914-1918 War, became CMG in 1915 and was promoted to Major-General in 1919. After the war, he acted as Deputy Housing Commissioner for Lancashire and Cheshire to 1921 when he retired to Castle House, Newbury where he died in 1943. It was originally erected by the Bristol Turnpike Trust. To give its full title from plans deposited in Parliament, this stretch of road was owned by ‘The Trustees of the Horfield Division of the Aust and Horfield District of the Bristol Turnpike Trust”. The Act establishing the Bristol Trust dated from April 1727 and was supposed to have lasted for 21 years only. Tolls were payable on carriages, wagons, cattle and sheep. A horse and cart had to pay 2d (just under 1p) – to put this in context the daily wages of a skilled craftsman then would be about 1 shilling, making the toll at each gate about £1 in today’s money. Successive Acts extended the Trust until tolls were eventually abolished on 1 November 1867. At that time there were local turnpike gates and tollhouses at Cheltenham Road (between the railway viaduct and the Zetland Road traffic lights), Redland Road (where Fernbank Road now joins it), Whiteladies Gate (where the railway line goes under Whiteladies Road) and St Michael’s (next to Cotham Parish Church). The significance of Aust as a destination was that it was the location of the ferry crossing of the River Severn to Beachley, i.e. the equivalent of the M4 motorway. The plate was almost certainly broken when Redland Road was widened in preparation for the opening of the tramway route from Zetland Road to the Downs on 22 December 1900. Other relics of the Bristol Turnpike Trust still visible are the Three Lamps signpost and another milepost on the Ladies Mile. “4 June 1759 The Door in the Garden Wall opening into Redland Green was made at the sole expense of Revd William Ray Minister of the Chapel. 25 June 1759 The wall around the Garden was repaired, pointed and capped with bricks at the sole expense of the same”. At that time what is now 157 Redland Road was the house built by John Cossins in 1751 for the Vicar of Westbury-on-Trym and the Minister of Redland Chapel. All the land on which Fernleigh Court, 151 Redland Road and the Church Halls now stand was the Vicarage Garden and appears to have been surrounded by a wall from the beginning. It is quite noticeable that the wall in front of 157 Redland Road is of different stone and may be a later construction – there is a reference in the above chronology to the erection of posts and rails in front of the House and Gardens in 1756. It is tempting to associate the sudden outlay by the Minister with the death of John Cossins on 19 April 1759. However there was no bequest to William Ray in John Cossins’ will (unlike the six neighbours who were to carry the coffin to the Chapel for which they were left £6 to buy mourning!). Why was the door built? The Garden of the Old Vicarage was completely surrounded by the wall – there was no opening where currently pedestrians and cars gain access to the Church Halls. If the Minister went via what is now Redland Road (and was then called Redland Lane), he would have had to walk through mud in winter and dust in summer as the road was probably not even covered in stones at this time. It would have therefore been much more pleasant and practical to walk through the Garden when going to the church to say the morning and evening daily services. The Vicarage and its grounds were sold to the South Western Electricity Board and the builders of two houses as well as the present Vicarage and Halls in about 1951. One of the houses was very interesting being designed by Burroughs and Hanham for Louis Ward, a children’s book illustrator who lived there until retiring and going into the Anglican ministry in 1973. What was then 155 and 153 Redland Road were demolished and Fernleigh Court erected. Residents of Redland Court Road may well recognise the stone wall featured in the foreground of the photograph as that surrounding the old St John Reade Hostel on Redland Green. It is the last remains of the ‘Palace’ built for the Bishop of Bristol in 1898 on land given by Greville Edwards. Greville Edwards had sold Redland Court in 1884 and moved to Butcombe Court, Somerset a year after marrying Florence Cave daughter of a prominent Bristol banker. Evidently he had retained ownership of some land in the Redland area because he also gave the land on the corner of Kersteman and Salisbury Roads on which St Katherine’s Church was built. The original Bishop’s Palace was behind the Cathedral and the present Cathedral School buildings and stretched out into the Canon’s Marsh as far as the railway buildings currently being transformed into the new Exploratory. The building was gutted in the 1831 Bristol Riots and some ruins remained until the 1960’s when a new School Hall was built on the site. The Bishopric of Bristol was amalgamated with Gloucester from 1836 to 1898. Stapleton House (which is now Colston’s School) was used by the Bishop of Gloucester from 1840 to 1856 but was sold by the Ecclesiastical Commissioners to help pay for a new Palace at Gloucester at a loss of over £12,000 at 1850’s prices. When the Bishopric of Bristol was refounded in 1894, a house in Berkeley Square was donated for use as a residence. In the words of Latimer, the new Bishop “intimated his desire that a properly constructed house should be built in the suburbs”. The architect of the new Palace at Redland Green was W.D.Carol and the cost was £13,000 (multiply by at least 100 to get today’s prices!). Its demise came in an Air Raid on 2 December 1940 when over 22,000 incendiary bombs were dropped. The Palace caught fire and a local resident has recalled how a human chain was formed to remove as many of the oil paintings as possible and the fire raged behind the beautiful stained glass windows of the house in contract with the surrounding total darkness. The site remained as ruins much used as a play area by local children until the St John Reade Hostel for the then Redland Training College and Bristol Poytechnic was built in 1968. Walking past the church recently, I met David Minshull looking for the grave of William Ellis Metford (which I showed him on the Woodstock Road side of the church). William Ellis Metford was the eldest son of William Metford, M.D., of Flook House, Taunton. He was apprenticed to one of Brunel’s resident engineers on the construction of the railway between Bristol and Exeter Railway from 1841 to 1846. After marrying a daughter of his father’s old college friend Dr. Wallis of Bristol, he obtained a job on the East Indian Railway. He and his wife arrived in India in 1857 just as the Mutiny broke out. His health broke down and they returned to England in spring 1858 where he lived for the rest of his life upon his private means. From 1852 Metford spent much effort and time in experiments and designs for rifles and their ammunition. From 1871 to 1894 the Metford rifle only four times failed to win the Duke of Cambridge’s prize of the National Rife Association. Many features of the 1883 Lee-Enfield .303 magazine rifle that became standard British Army issue were due to Metford. All the bullets used in his match and military rifles were made in his house (Redland Villa) in Elm Lane. He died there in 1899 aged 75. His biographer says, “though devoted chiefly to scientific pursuits, .. he was above all a God-fearing man”. Metford Road across the Green appears to have been given its name in the 1930’s because of the ownership of the land by Baron Cottesloe who was a keen rifleman and a ‘disciple’ of Metford.